This is a brand new SX10 with an inbuilt 3M digital camera that works perfectly. However there are two small faint marks seen in the image when there is no specimen present - on a ‘busy’ specimen they can hardly be seen. We have been unable to find and remove these blemishes and would not advise the purchaser to attempt to dismantle the unit - it is complicated in there. However the software and USB cables are provided along with IT support if needed all for no charge with the microscope being sold at slightly less than the price of our non digital SX10. Incident and transmitted LED illumination with button brightness control. Magnification options x10, x20 and x40. Vickers were one of the main microscope suppliers of the last century and this is an excellent example of their well built stereomicroscopes. It is perhaps no coincident that Vickers also made military tanks as there is something ‘tank-like’ about this substantial microscope. Mechanically it will last for ever and optically it has that British made feel. The microscope has three objectives mounted in a turret allowing magnification options of x15, x35 and x50 with the x10 eyepieces. In addition it has a transmitted lighting mirror system. A fine microscope now a collectors piece. Originally supplied by ourselves the MX4T has turret mounted objectives allowing the magnification options of x10 and x30. Incident halogen lighting system with on/off switch. Coarse focus pole stand with a rack and pinion fine focus system. Condition very good. One of the classic British stereos with a very characteristic shape and paint finish. Turret mounted objectives x1.5, x5 and x10 giving the microscope magnification options of x15, x50 and x100 with the x10 wide field eyepieces. Substage mirror illumination and side arm support arms. The condition is very good. An excellent value stereomicroscope for the beginner. Upright eyetubes for ease of use and with an x2 objective pair with x10 wide field eyepieces giving an overall magnification of x20. Black and white stage plate with stage clips. Condition - as new. Another of the classic British stereos with a very characteristic shape and paint finish. This model has standard 23mm eyetubes with original wide field eyepieces. The characteristic rotating turret has a x1.4 and x4 objective set giving overall magnification options of x14 and x40. The microscope has inbuilt tungsten transmitted lighting (but no incident light unit). This is now probably a collectors item although still optically fine. This is a combination used only by ourselves for customer demonstration. IMXZ trinocular stereo head on a dual LED light source stand from or BSR range. Magnification range of x10 to x40 in continuous zoom with an index pause at the x20 mark as a reference point. Pole stand base with a rack and pinion fine focus system with individual brightness controlled incident and transmitted lighting systems that can be used together or independently. Condition as new and fully guaranteed. This very popular stereomicroscope is sold by our sister company Apex Microscopes. This particular unit is new and has only been used for customer demonstrations by ourselves and comes fully guaranteed. The Explorer plus is a turret mounted stereo with a choice of x20 and x40 magnification achieved by simply rotating the microscope head. In addition to the standard x10 eyepieces there are also a pair of x20 eyepieces which then gives the magnification options of x20, x40 and x80. Brightness controlled LED lighting both incident and transmitted. These can be used separately or together as required. Rack and pinion focus, stage clips and black/white dissection plate. Complete with custom made aluminium ‘pilot’ style carrying case with double catch and carrying handle. Condition pristine. A saving of £50. Used only by ourselves for customer demonstrations this is an excellent example of our very popular MX series stereomicroscopes. The microscope has x1 and x2 objective pairs mounted in its turret which is part rotated to change magnification.With x10 wide field eyepieces giving an overall magnification options of x10 and x20. Pole stand coarse focus with a rack and pinion fine focus. Interpupillary and dioptric adjustment. Stage clips and a reversible black/white dissection plate. An ideal microscope for entry level. Used only by ourselves for customer demonstrations. This is a click stop zoom stereomicroscope with camera side port. The click magnification options are x10, x17.5, x3 and x55. The eyepieces are extra wide field. The plain stand has a pole movement for coarse focus and a rack and pinion fine focus. Condition as new and fully guaranteed. This is actually a new microscope and comes with our Brunel guarantee. A good solid microscope. The stand has dual illumination with the incident system being halogen and the transmitted light unit being a fluorescent strip light. Black/white and frosted glass dissection plate. The steelhead has a zoom magnification range of x6.5 to x45 with the wide field x10 eyepieces. Originally supplied by ourselves a relatively short time ago. 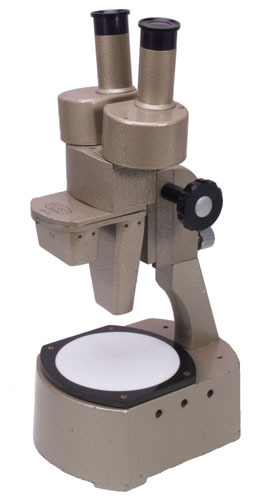 This BMSF trinocular has the option of x10 and x30 magnification that is achieved by rotating the stereohead turret. There is a push/pull lever that brings the trinocular tube into optical alignment for photography. X10 wide field eyepieces. The plain stand has a reversible black/white dissection plate. Very good condition. This is a long arm stereo with a magnificent stand system. The stand was originally made for Wild but now has a contemporary stereohead of excellent optical performance. The stand has a double horizontal arm system which provides great rigidity to the system. The stereohad is a binocular zoom stereo with a zoom range of x8 to x80. The eyepieces are super wide field and the objective is plan. This is an excellent system for those with space (it’s big! combining stability with excellent optical performance. Highly recommended. This is an excellent example of our own BSR zoom stereomicroscope. Recently supplied by ourselves and kept in pristine condition. Zoom magnification range x6 to x60 with extra wide field x10 eyepieces. Interpupillary and dioptric adjustments. The stand is plain without any in built lighting and has a rack and pinion focus mechanism throughout its length. Recommended. Originally supplied by ourselves this is a good example of our BMX4 stereohead on a plain pole stand. The x2/x4 objectives are alternated via either of the two side arm controls. Both x10 and x20 eyepieces are supplied which provides the options of x20, x40 and x80 magnifications. The pole stand has a rack and pinion focus mechanism with a reversible white and black dissection/work area. This microscope is new and has been used as an assessment microscope and we have subsequently decided to add this range to our product profile. A good sturdy microscope that will do well with the rigours of commercial life. Trinocular with a camera port. Zoom magnification range x7 to x45. Excellent super wide field x10 eyepieces. Plain stand with pole coarse focus and rack and pinion fine focus. This is a new microscope and fully guaranteed.